After a 5-day stretch of not being out on the water due to rough sea conditions – it was great to get back on the water Sunday! On Sunday 10/5, we headed the SW corner of Stellwagen in hopes that the whales would still be there – and when we arrived we were excited to see several blows scattered through the area! We first passed by the grand dame Salt, who has appeared to have weaned her calf early this season (her calf Epsom has been sighted on its own elsewhere). Early weaning can happen on occasion, and with a veteran like Salt, I’m sure she has gotten the calf-rearing down pat! We did however spot a calf rolling and flippering in the distance, and it turned out to be Wizard and her calf! (see photos). Wizard and her calf then began traveling throughout the area, and her calf was fluking very nicely today. They also appeared to be foraging- at one point later in the trip we observed a bubble cloud forming right as they surfaced to breathe. One of the most exciting parts of our trips today was a look at huge Ocean Sunfish, or Mola mola, right next to our boat! (see photos). I hadn’t had a great mola mola look for quite some time this season, so I very much enjoyed this up-close look of the largest bony-fish that weighs about 2000 pounds on average. While offshore we also spotted humpback whale Canine, as well as a few other individuals that were too far to ID. Also our Stellwagen Seabird Stewards, who come aboard to research the seabirds we see on our trips, spotted many birds today in their count – including Northern Gannets, Cory’s & Great Shearwaters, Black Backed gulls, and White-Winged Scoters. Great day back on the water! We were very excited to get back out there on the water today! We went to the southwest corner of the bank this afternoon and, before even arriving, we saw dozens maybe even hundreds of northern gannets swarming over the surface of the water. Right beneath them was a pod of 20 to 30 Atlantic white-sided dolphins! I Prior to today, I hadn’t seen dolphins since the spring time making this feeding frenzy a welcomed sight. 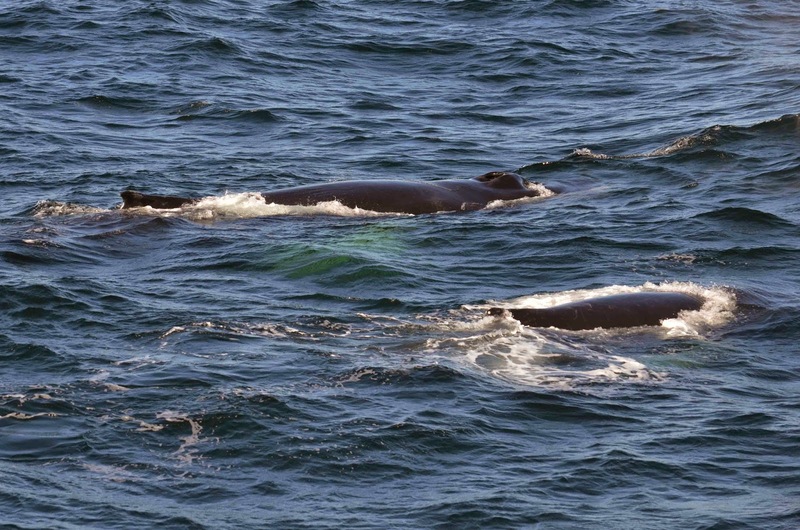 As we moved on and approached the bank, we noticed at least five different humpback whales in the area. 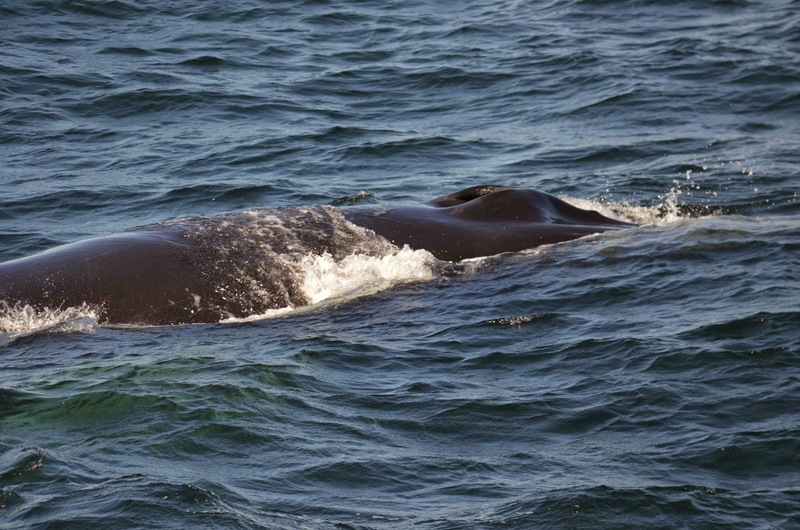 We chose to spend our whale watch with Wizard and her calf! Wizard was making about four-minute dives while her calf spent most of the time logging at the surface of the water. 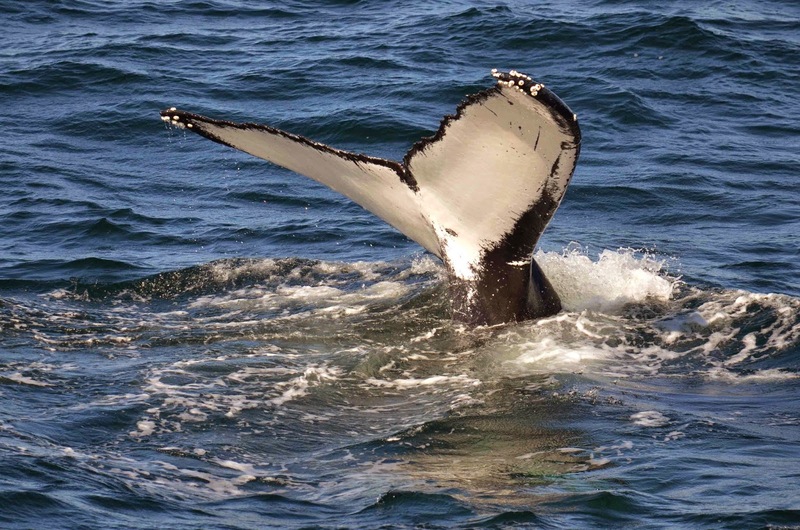 Both whales treated guests with incredibly close approaches to the boat. At one point, they were so close to the that I couldn’t even see them from up top on the center of the cat walk! Overall, it was a beautiful day on the water!